This high quality Yixing Tea Cup is perfect for keeping your tea warm. Like Yixing teapot, you can season this tea cup with your favorite tea. 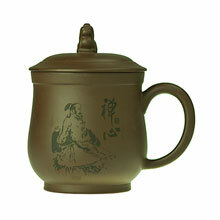 A beautifully sculptured lion sits atop the lid cover and the center of the cup features the painting of a Zen master.